Motivation: Gene assembly is an important step in functional analysis of shotgun metagenomic data. Nonetheless, strain aware assembly remains a challenging task, as current assembly tools often fail to distinguish among strain variants or require closely related reference genomes of the studied species to be available. 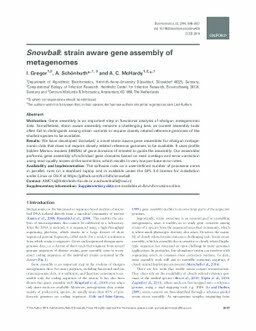 Results: We have developed Snowball, a novel strain aware gene assembler for shotgun metagenomic data that does not require closely related reference genomes to be available. It uses profile hidden Markov models (HMMs) of gene domains of interest to guide the assembly. Our assembler performs gene assembly of individual gene domains based on read overlaps and error correction using read quality scores at the same time, which results in very low per-base error rates. Availability and Implementation: The software runs on a user-defined number of processor cores in parallel, runs on a standard laptop and is available under the GPL 3.0 license for installation under Linux or OS X at https://github.com/hzi-bifo/snowball.